In my last post, I wrote about my frustration with Take Ten Kits. I love the kits but hate the shipping costs so I went on a search for a new, cheap replacement to the Take Ten Kits. I’m thrilled to say that my search paid off and I found a new kit for just $10 and only $4 shipping to Canada! Sign. Me. Up! 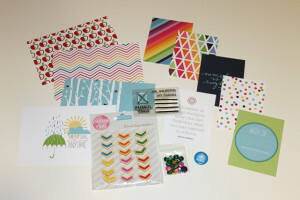 Each month you will receive a package full of awesome-delivered right to your door! It will include the latest embellishments from the manufacturers we carry in the store and sometimes some exclusive products. Umm, YES!! Just what I’m looking for…yay!! I ordered my “Swag Bag” and it arrived in record time. That may have something to do with Christmas being just around the corner. I’ll find out for sure next month. Impressed in an understatement. It came wrapped in tissue paper with a pretty red bow. I, of course, ripped the paper off before taking a picture. I promise to try to control myself next month and get a pic first. 🙂 There was even a little thank you note from Paper Issues owner Cassie. Love those little details!! The amount of stuff in this little $10 pack is amazing! There was lots of “Oohh’s” and “Aahh’s” as I went through everything. I can’t wait until next months package!! Take Ten Kits…Love or Hate? Earlier this year I made the decision to give Project Life a try. I’d always wanted to have a scrapbook/journal but found the idea of 12 x 12 pages quite intimidating. Seriously, what are you suppose to put on such a big page without taking away from the photos or the pages looking too cluttered or bare. Project Life was just what I was looking for. I could beautifully document life without feeling overwhelmed! A couple of months ago, I joined a Facebook group devoted to Project Life. The talent of these ladies is beyond incredible. Their work is so inspiring! 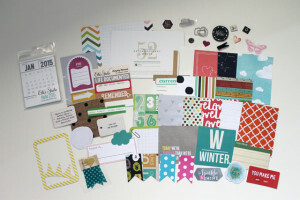 It was here that I heard about a small company offering monthly pocket scrapbooking kits at only $10 per month…amazing! And shipping was a mere $4…thrilling! As a Canadian, there’s nothing worse then finding an awesome online store only to realize their shipping costs are inflated. I mean, $32 to ship a $5 pen…you’ve got to be kidding, right? 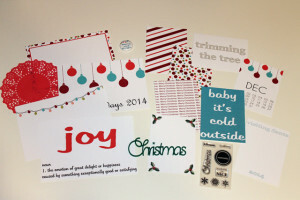 As a Canadian with only one Michael’s store in my province, I purchase 90% of my crafting supplies online. It’s fair to say I know reasonable shipping costs when I see them.You can imagine my disappointment when I was suddenly invoiced a shipping charge of $7 for a $10 kit that weighs 3 ounces and fits in a small padded envelope. The reason for the higher shipping, I discovered, is kits are shipped as a package instead of a large envelope. A package ships for about $8 and includes a tracking number whereas an envelope does not include tracking and ships for $3. Understandably, the owner of Take Ten Kits will not ship as an envelope since she has had problems with lost packages. Call me cheap but I’m unwilling to pay $7 for shipping and have cancelled my subscription. I’m beyond disappointed! I absolutely LOVE the Take Ten kits. I HATE that the shipping costs are so high. I DESPISE that I wasn’t able to pay the cheaper shipping cost even though I was more then willing to risk the package getting lost or damaged. Oh well…c’est la vie!! The search is on for a replacement subscription! !